Hungary — Ready for the Big Bang? As Hungary is about to join the EU, how ready is its economy? Inclusion at long last — Good for all? Hungary has been extremely successful in transforming itself from a communist-run state into a market economy. Today, it has a smoothly functioning private economy with modern competition laws and a sound financial services sector. The central bank is independent. Unemployment stands at only about 5%. The President of Hungary calls it a “small miracle” that 70% of the country’s foreign trade is accounted for by the other EU states. Fifteen years ago, such a close integration with western Europe would have been inconceivable. In all these respects, Hungary’s accession to the EU has been well-prepared. Unfortunately, macroeconomic policy has not lived up to the same level of performance. Budget deficits have risen sharply — to over 5% of GDP. Government spending as a share of GDP has climbed to 50%. Wages have been boosted far beyond the increase in productivity, with real wage growth in the last two years of about 20%. The trade deficit has grown as well. All this has undermined international investor confidence, made it necessary to raise interest rates — and has led to instability on foreign exchange markets. This really is the weak spot of Hungary’s EU accession, especially its eventual accession to the European monetary union, for which no date has yet been set. Faced with these challenges, the new Hungarian Finance Minister Tibor Draskovics aims to do his utmost to reduce the budget deficit, cut government expenditures, lower taxes and make his country's public administration more efficient. The target is a government expenditure rate of 40% of GDP. The new finance minister — much like his colleagues in the West — stresses the importance of improving conditions for economic growth and fostering entrepreneurship. The Hungarian central bank has rewarded this positive message with a slight interest rate cut (from 12.50% to 12.25%), although this leaves rates still at a high level. At the same time, Hungary’s eventual membership in Europe’s single currency — the euro — has been postponed. Giving up the country’s exchange rate policy and adhering to the discipline of monetary union is proving to be much more difficult than originally thought. The finance minister has mentioned the year 2008 as the earliest possible date to join the eurozone — but he could also see it happening as late as 2009 or 2010. This would not be a disaster. On the contrary, this more realistic stance is a positive sign for eventual successful adoption of the European currency. With time for additional reforms, Hungary will be more ready for the euro. Onto the next big question: Why should a Western company invest in Hungary? In the West, lower Eastern European wages are always cited as an incentive. But this can only be a temporary incentive, because wages change — and there are always new low-wage countries in the world. It is better for countries in Central and Eastern Europe to rely on more sustainable factors, such as a good infrastructure, well-trained employees, low taxes and a government that heeds the needs of investors. People in Hungary often talk about Ireland as a model. In the late 1980s, Ireland relied initially on its cheap labor as an incentive to attract industry — but was not successful with that strategy. Only in the 1990s did it switch to generally more favorable investment conditions. If the accession countries do in fact take this track, it would be good news and bad news at the same time. The good news: The problem of wage differentials between West and East would not be so prominent as is feared today. The “bad” news is that Western governments would be faced not only with lower wages in the East, but also with considerable tax competition and — more broadly — general competition on attractive investment conditions. At the end of the day, however, this is helpful for everybody, since it forces governments to pursue more competitive policies. On the whole, the general mood in Hungary shortly before joining the EU is not positive. People know that hard times lie ahead. Prices, particularly politically sensitive food prices, will rise. Competition will become steeper and more insolvencies — and perhaps also more unemployment — is likely to follow. The additional adjustment funds from Brussels will be rather modest — and it will be hard for an administration lacking practice in navigating the EU bureaucracy to apply for more financial support. Policymakers are afraid to be overruled in Brussels and to see their needs ignored. On the other hand, the advantages of joining the EU will only make themselves felt after some time. All of this will intensify political conflict. The opposition will be inclined to argue in a more populist fashion, which in turn will make it difficult for the government to make compromises in Brussels. It might be that the next Hungarian government (elections are slated for 2006) will be far less disciplined. Altogether, this makes life harder for the EU. As a result, it is safe to predict that Europe will be preoccupied with itself for the foreseeable future. The EU — What Is It? 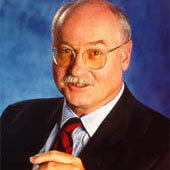 Martin Hüfner is the former chief economist of Germany's HVB Group.